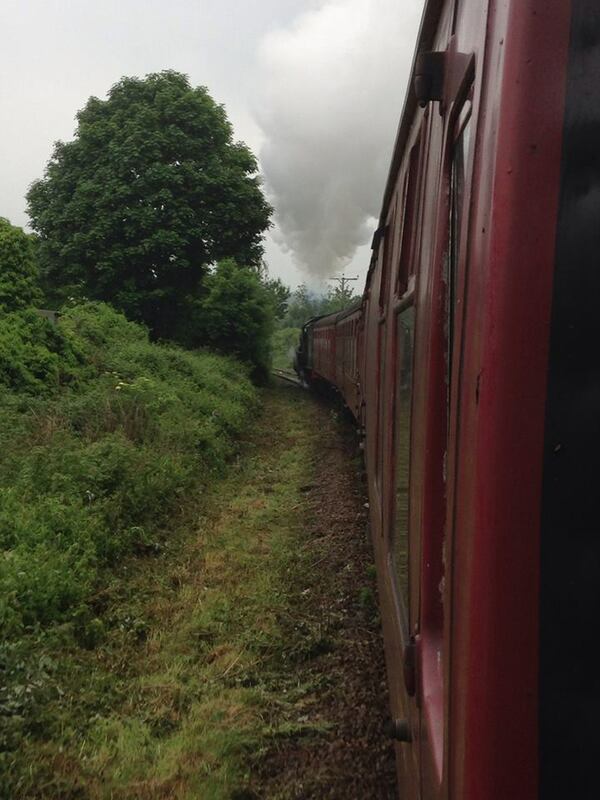 Last weekend, the Asperger’s Flyer travelled to two heritage railways, a big undertaking for the charity and the first time that there had been two consecutive events at two different railways. Quite an achievement for the charity, which only started two years ago. On June 7th and 8th, The Aspergers Flyer made a victorious and groundbreaking leap into the record books when it raced for over 150 miles to promote Asperger’s and Autism. On Saturday the 7th, the Flyer left Pickering at 9 and by 7 that night, it had made it’s mainline debut and had worked through stunning moorland, flying along at 45mph! 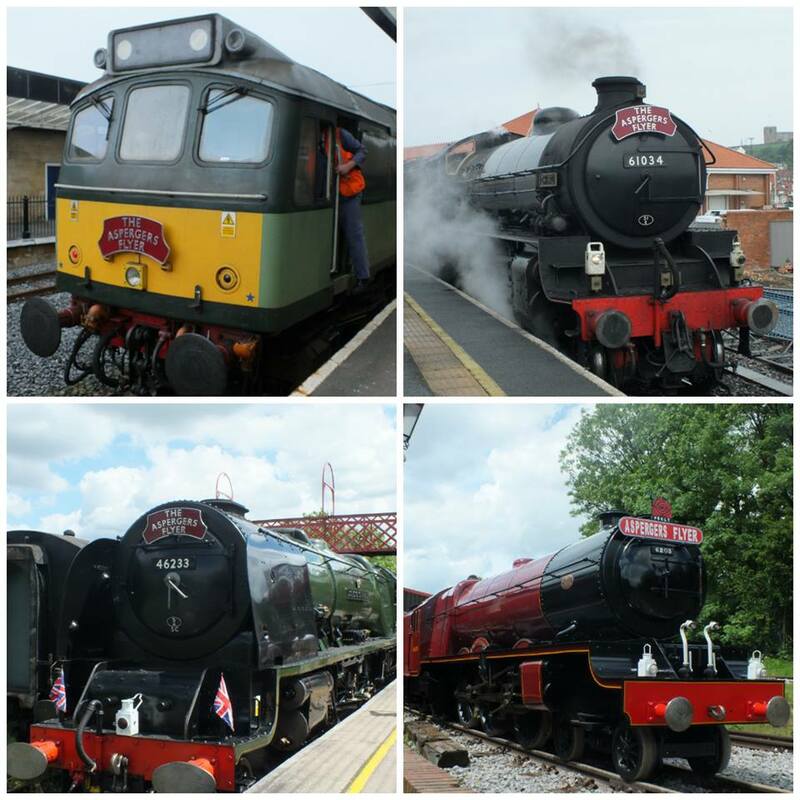 On June 8th, the Flyer returned to the Midland Railway Centre to remember life on the Home Front, running with 6233 Duchess of Sutherland and the Princess Royal Class Locomotive Trust Butlins locomotive, Princess Margaret Rose, simultaneously! On Saturday 7th, the North Yorkshire Moors Railway was the first time that the Flyer had travelled on the National Network, to the seaside town of Whitby. The Flyer travelled behind two locomotives, Class 25 D7628, ‘Sybilla’ and ex LNER B1 61034 ‘Chiru’. Below are some images from the event. 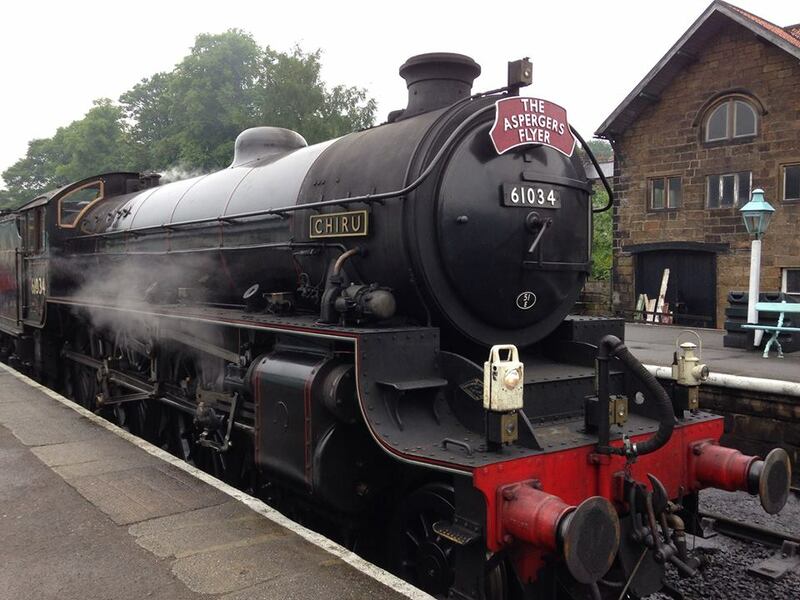 The Flyer pulls into Heartbeat-famed Goathland. The Flyer storming out of Whitby Town. The Flyer standing victorious at Grosmont tonight after it’s mainline debut! Over 100 Flyer steam miles today with Chiru! When we arrived in Whitby, the headboard was transferred to 61264 which was masquerading as a once local B1, Chiru, which hauled the last train through to Stockton 60 years ago. Then, we really began to fly! For mile after mile, the Flyer bucketed along the line at 45mph, a speed only reached with heritage railway operators on this line. Chiru performed impeccably all day and by the time the news broke of the day’s success in late afternoon, we had collected £200 to pay for our first pieces of equipment for events. The Flyer and her crew! Both gentlemen were pleased to be able to play their parts. We’d like to thank all those who helped throughout the weekend as they all made sure the Flyer ran smoothly. Chiru’s Flyer was impeccable! She worked an amazing 102 Flyer miles over the day and brought the Flyer to a whole new audience! 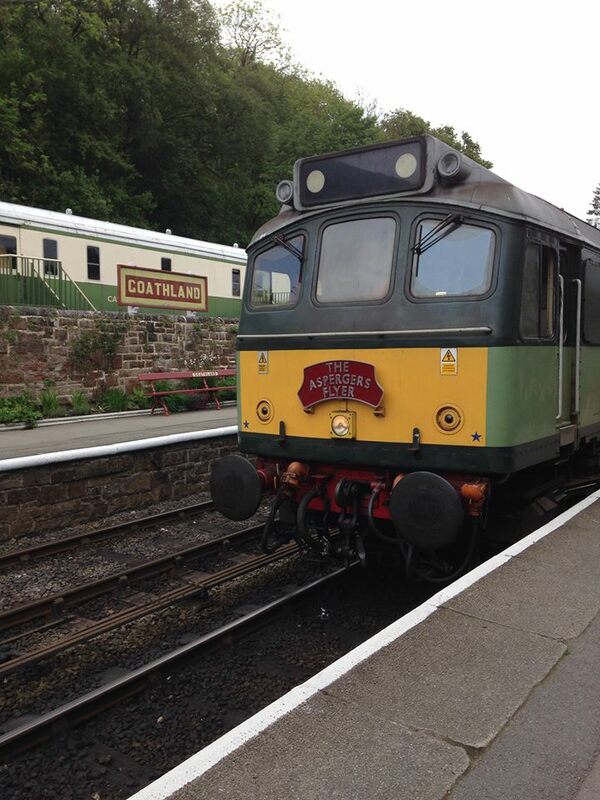 The first leg of this epic weekend was kicked off by the NYMR’s ‘Sybilla’. This diesel locomotive represented the changes of the 1950s, the period we recreate most, which can be neglected. Sadly, later in the day, Sybilla failed. Next, on Sunday, 8th, The Flyer visited The Midland Railway Centre, at Butterly, for a very British Event, the 70th anniversary of D-Day. 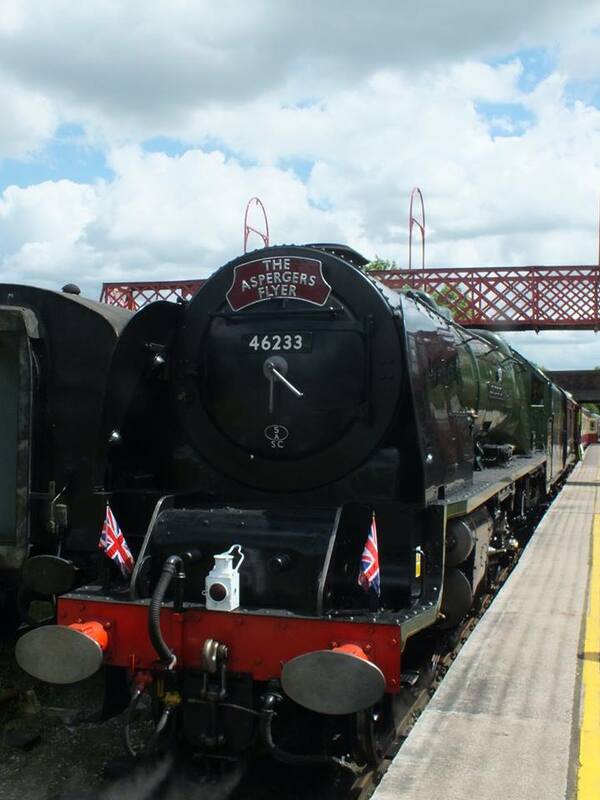 The headboard of the Flyer was placed on ex LMS 46233 Duchess of Sunderland, a very special locomotive for the Flyer and definitely a Royal locomotive. Below are some images from the event. How could we top that you ask? What more could our team pull out of the bag, eh? Well, to add to Saturday’s triumphant runs, the Flyer appeared at the Midland Railway Centre running with 6233 Duchess of Sutherland with permission from the Princess Royal Class Locomotive Trust who were holding a 1940s weekend at their West Shed base. With re-enactors swelling visitor numbers, the Flyer was taken back through history to those fateful days in 1944. The big surprise came when we noticed the Trust’s 21 inch gauge Princess Margaret Rose which once carried thousands of visitiors around Billy Butlin’s famous holiday resorts. The engine was, low and behold, carrying it’s own Aspergers Flyer headboard! A PRCLT volunteer, Sam Bythway, organised the surprise for our chairman. Thanks Sam! This headboard is now going on loan to the a railway modelling group for display. The Surprise Flyer! A PRCLT volunteer, Sam Bythway, carefully constructed this second Flyer headboard as a surprise for our Chairman, Oliver! Designed to fit the iconic Butlins locomotives of the 1950s and 60s, it’s seen here with Princess Margaret Rose. 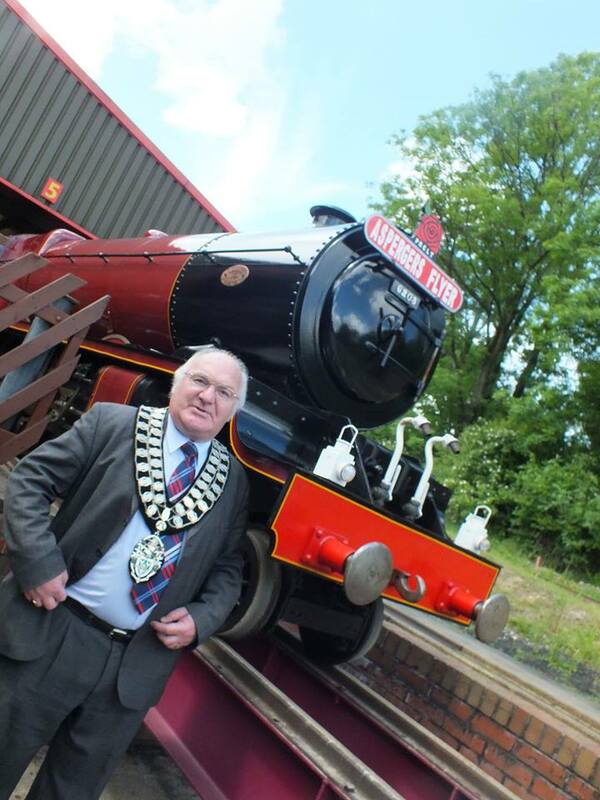 Even the Mayor of Ripley was treated to a ride on this brand new Flyer. He was extremely supportive and embraced the work we do. Sadly, not everyone could be pleased, Someone looked very jealous not to have the honour of heading the Flyer! 4 Flyers, 2 Days! The Four Flyer Girls of this weekend’s D Day commemorations. 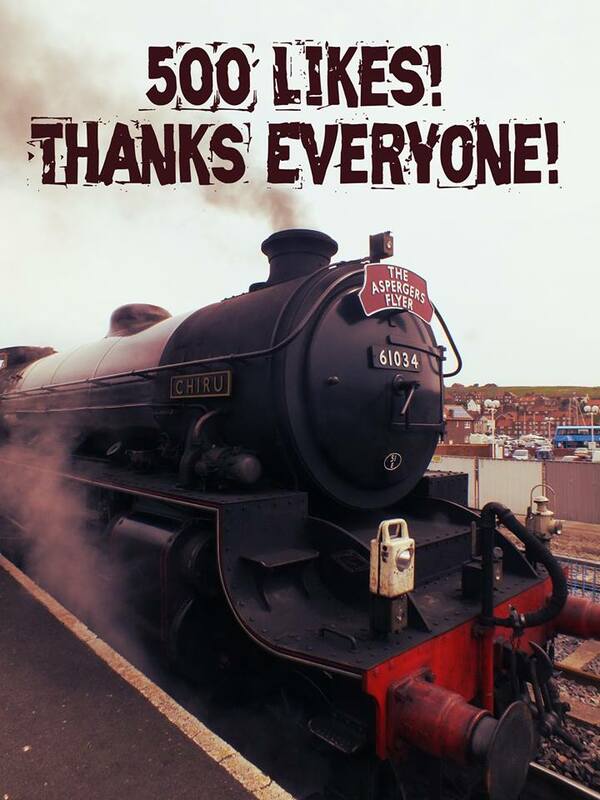 Over these past 48 hours, the Flyer has covered an amazing 152 miles, made it’s mainline debut, run with a royal engine and we’ve raised £200 towards a very special new project! It is also sad to announce the passing of Dr Lorna Wing, on the 9th June, one of the NAS’ founders who coined the widely used name ‘Asperger’s syndrome. I hope all of the Loco Yard readers and contributors can send condolences to her family. 12/06/2014 in 1306mayflower, Asperger's flyer, North Yorkshire Moors. Thanks, though it was all Oliver Morgan, the Chairman of the Charity, as he puts tons of effort to get the events organised. Thanks again for the comment Simon. It’s all very impressive, it’s great to see so much support and know that getting this far must have taken a lot of effort. Brilliant stuff!